One unexpected consequence of the HITECH Act is the emergence of a physician stereotype – a doctor who favors paper records over software, a provider who can’t manage online scheduling and instead remains committed to scheduling appointments over the phone. But does this popular narrative contain any truth? Yes, the transition to electronic medical records remains uneasy, but the begrudging acceptance or even downright rejection of one piece of technology shouldn’t paint an entire nation of physicians as techno-phobes. Has the digitization of patient records revealed a hole in the tools physicians use to treat patients? Are expectations for a physician’s use of technology simply overblown, or is there a misrepresentation of how physicians use technology? Several sources feed the demand for more technologically savvy doctors. Chief among these is the absurdly complex process of obtaining and transferring patient records in paper form. If you ask your primary care physician for your files, she’ll have to print them for you – perhaps even at a cost. Now you’re tasked with carrying around a manila envelope – or depending on your personal condition, a huge MRI scan – to every specialist you go to. Frankly, we’re light years past this point as consumers, and the previous example assumes a scenario of relative simplicity. Consider if you had to travel to multiple providers to build a somewhat comprehensible patient record. Perhaps you’ve moved out of state and the only provider with your records is hundreds of miles away. Beyond the needless complexity for paper records for patients, there’s also the matter of how US healthcare costs stack up against the rest of the world. It’s no secret that the US healthcare system is expensive, and in some cases inefficient. Other nations have utilized technology systems like EHRs for years, and while different delivery models account for much of the inefficiency in the US, the theoretical position of technology as a cost reducer is a strong one. So, the demand for better technology in healthcare is being driven by the dual forces of changing consumer demand for convenience and government demand for efficiency. Needless to say, transition in a system as complex as healthcare isn’t easy, especially given the movement of healthcare providers from mostly independently owned operations to vast networks. But can the unwieldy nature of this transition be laid at the feet of physicians? Is their xenophobia to technology holding back the progress of an entire industry? In hopes of discovering a more realistic picture of the American physician’s technology habits, let’s examine some recent findings. In terms of technology directly related to the business functions of running a practice, hospital, or surgery center, physicians are mostly on board. In 2013, ZocDoc conducted a survey and found that 74 percent of physicians use practice management software in their office, 63 percent allow patients to fill out forms online, and 62 percent have sent prescriptions to patients electronically. 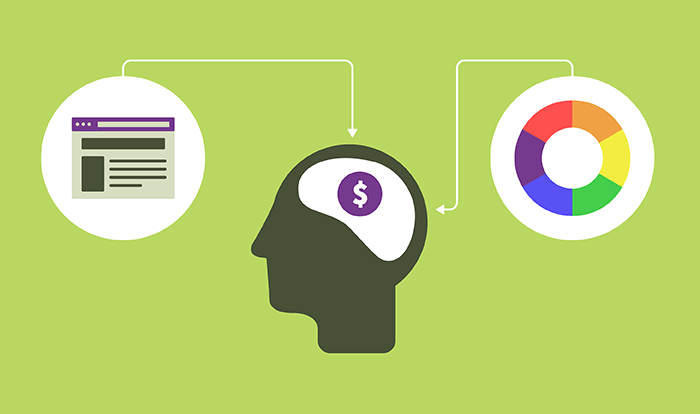 The sample size for this study was somewhat small at 360, but the overall trend shows that many physicians are using technology for scheduling, financials, and even prescription communication. It’s logical that these areas have experienced significant adoption, because they help increase business efficiency. And electronic medical records? Well, that number stands somewhere between SK&A’s estimated 63 percent and the National Center for Health Care Statistics 78 percent. Either way, the number is high, but satisfaction is still middling, and certain functionality remains limited. Business technologies deal mainly with the consumer convenience and cost savings mentioned earlier. 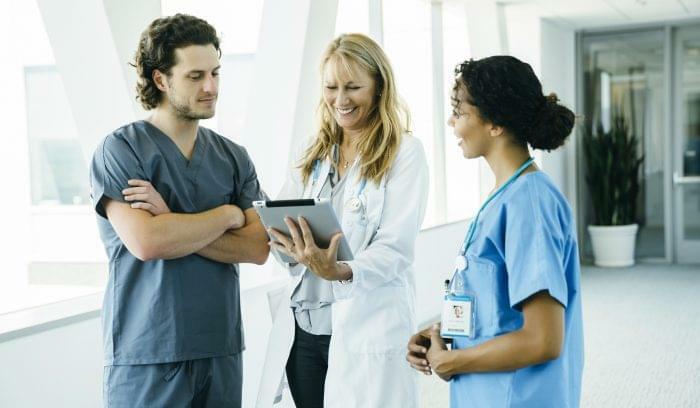 Ideally, if care coordination can be improved through technology, patients will be able to move between providers easily without being subjected to redundant tests or wrong procedures – both of which increase costs and decrease quality. Moving away from the esoteric technologies of practice management and EHRs, examining how physicians use the internet in clinical practice can be fascinating. The expanding body of modern medical research has made it impossible for any physician to simply remember every best practice or consultation. So do physicians dust off the old text books and comb through pages upon pages of medical research? Hardly. 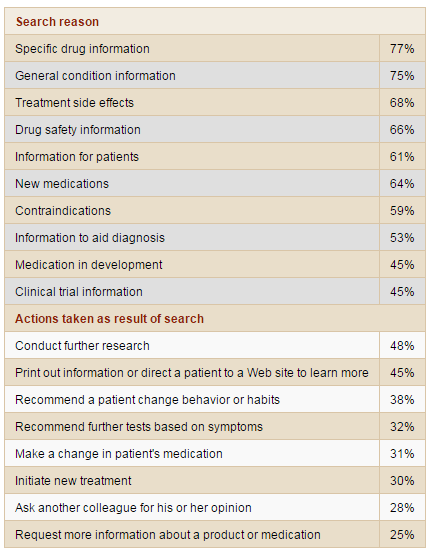 In 2009, a Google-commissioned survey by Hall & Partners sought to find out how physicians used the web to supplement their clinical habits. The results? Some 86 percent of American physicians use the internet to gather health, clinical, or prescription information. A Manhattan Research survey earlier in the year put the number closer to 92 percent. Of course, the researchers were quick to point out that no evidence existed to suggest that physicians made decisions solely based on the information they gathered online. Regardless, it’s clear that accessing massive archives of evidence-based medicine has never been easier, and U.S. doctors aren’t hesitant to search for clinical information online in hopes of better treating their patients. And speaking of using tools to find relevant information, U.S. physicians also display a healthy use of mobile technology to perform their daily job functions. 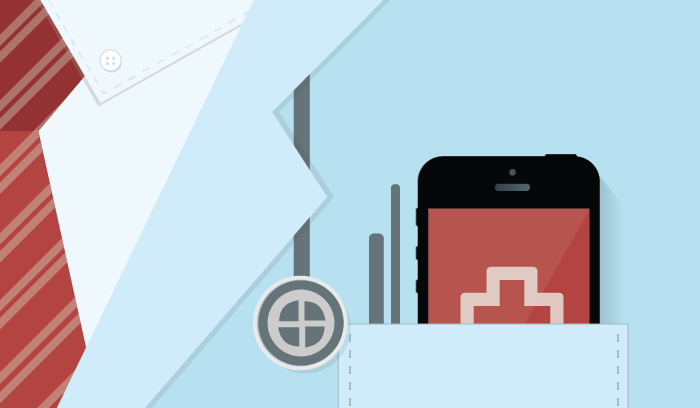 Epocrates, the most popular mobile app for clinical use, is estimated to be used by around 70 percent of physicians. This application enables providers to search for best practices and other clinical information in a database maintained by vetted, certified physicians. Further, it’s estimated that around 80 percent of physicians use a mobile device during work hours for clinical purposes. And for access to an EHR? 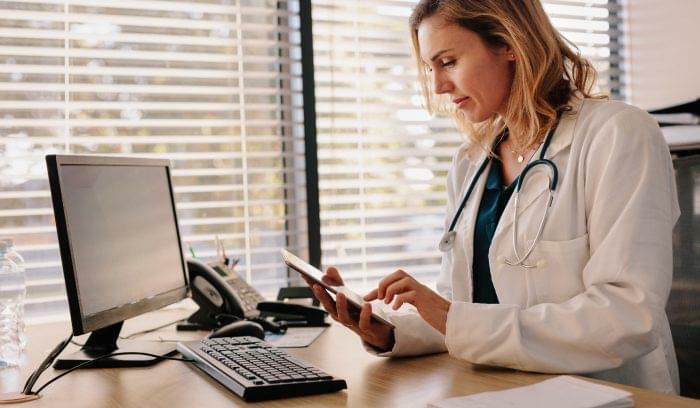 One study found 100 percent of physician respondents who were searching for an EHR said mobile accessibility was a must have. 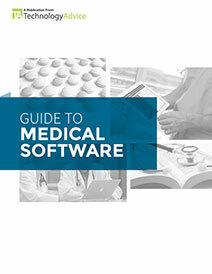 Manhattan Research also reports that 72 percent of physicians have adopted tablet computers. So it doesn’t appear physicians have a problem integrating their mobile devices in clinical practice. Zocdoc’s survey also found that 87 percent of physicians under 56 use social media on an individual basis, whether simply in their personal lives or to engage patients by offering medical advice. This number is high, and likely reflects heavy use in a non-professional setting. 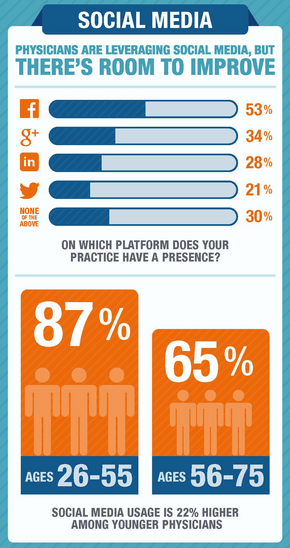 When the presence of a provider’s practice was measured on social media, the results were much lower: Facebook was the only medium to report higher than 40 percent. And while having doctors use their personal social media profiles to disseminate reliable advice is important, a practice profile probably receives much higher interact from patients. This signals an area in need of improvement, especially considering that so many consumers use social media as means to reach customer service, including medical. Squandered Possibilities or Simply a Diffusion Curve? So in nearly every other aspect except EHR use, it seems physicians are above average users of technology. Do opportunities still exist? Of course. E-consultations offer a fascinating avenue for lowering the cost of an office visit and increasing access for rural areas, and integrating remote monitoring systems such as Apple’s healthkit offer a great way to manage chronic illness. Further, concierge physicians who have reverted to making house calls in order to cut out the bureaucracy of owning an office building and running practice offer patients a compelling, personalized alternative to the way medicine is normally delivered. Care coordination could always improve as well, even at a hospital level. However, it seems most physicians are attempting to use most of the technological tools are their disposal. Naturally, higher technology use is correlated with younger physician demographics, and doctors, like other technology users, will always be more apt to use systems that offer them an intuitive experience. But neither of these caveats signals a technology aversion by American doctors. The reality appears to be quite the opposite.